FIRST OF ALL THIS AND OTHER CAMERAS HAS THE HALF HOUR VIDO RECORDING LIMITATION, WHICH IS FINE, BUT THIS CAMERA HAS THE LIMITATIONS OF ITS OWN, WHILE VIDEO RECORDING, IT SHUTS DOWN IN 5MIN 10 MIN OR SOMETIMES IF YOU ARE LUCKY IT GOES UP TO 30 MINUTES. SO I WOULDN'T RECOMMEND TO ANYONE TO BUY THIS CAMERA IF HE IS PLANNING TO RECORD VIDEOS ON IT. I was very happy with this purchase for the duration that it lasted. JUST outside of one year manufacturer's warranty, it started to give an error. Couldn't recognize lens. It is really unfortunate as I really liked the functionality and compact size of the camera. As suggested in another review, Sony couldn't help me and I have to address the repair at my own expense. Wow. This camera is simply amazing for the photo newbie in me. It does take great photos, and even when you don't have lots of knowledge (ISO, manual focus efficency, etc. ), you can achieve excellent results. I got this camera with the 55-210 lens and a bag as part of a kit on Boxing Day, paid a ridiculous price for the kit, and am very happy! The lens it comes with is great, but having the 55-210 as well makes this camera whole. The wi-fi photo transfer to mobile phones is an awesome feature. You can also have a remote shutter on your phone. Only downside for a 2010's camera is the fact that you can't turn the preview screen on selfie mode...but with all the other features and quality of photos it offers, I don't really mind after all. Strongly recommend buying this camera. I am impressed with the quality of the photos. I'm used to a DSLR but wanted something lightweight that still produced good pics. So far, so good. Seems easy to use. I just read that it doesn't last long but I hope that was the exception not the rule. I've only had it two weeks. I've taken some scenery photos and some flower photos and they're great. Purchased a Sony A6000 from Best Buy and really, really liked it. Fast to start, super quick focus, and took great picts. Just wish it lasted a little longer. Only 4 months out of warranty, I turned it on and received a "Camera Error. Turn power off then on" message on back screen. I turned it off then on (a lot), removed the battery, swapped lenses and everything else others that have had the same problem with Sony cameras on the internet suggested but nothing will clear the message and the shutter is stuck closed. After much Googling it appears to be a problem that affects the A6000 and other Sony Alpha cameras. Have contacted Sony about it and they have so far been unresponsive other than to tell me to send it off to get fixed at my expense. Highly recommend this camera but if you buy it make sure you buy the extended warranty and extend it to the max cause it may not work for long. Needed a good camera to take action pictures of my nephew's hockey and soccer games. 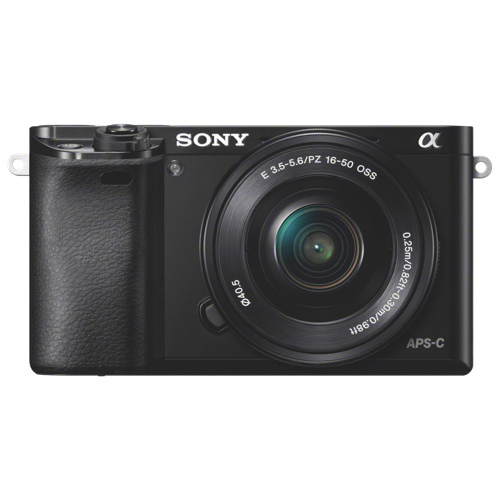 Chose the A6000 because of high review ratings for Continuous Autofocus and Shooting - 11 fps is the fastest available. Bought on sale with standard and telephoto zoom lenses and carry bag. The A6000 takes amazing pictures and HD Movies. It has many Pro Quality settings and there are many reviews and tutorials (text and videos) on-line to help understand the many settings. One caution - buy an extra battery since 1) viewfinder is LCD (vs optical in DSLR's) 2) Shooting continuous video is power hungry. I ordered the Sony camera and a 32gb memory card but I only received the camera. It's been more than 7 business days and I haven't received the memory card yet. I'm waiting for a solution, because the call center said me to wait for their investigation (3-5 business days). It is a shame for best buy. I went to the shop and call the customer service and I'm still with no response! DO NOT TRUST IN BEST BUY! Poor after sales service! This is an excellent camera. The photo quality is very sharp and when used properly it can produce professional quality photos. I purchased this with both lenses (18-50 / 55-210) and have been using both. I particularly like the telephoto lens for taking sport action shots. I wanted something small and easy to use that could take professional grade photos for my website, so far I'm completely satisfied. Great value! A very capable camera indeed. It has a better sensor than contemporary Nikon and Canon APS-C SLRs. The size, handling, weight, etc. all are excellent. There is an extensive array of lenses (with many Zeiss ones) are available for the e-mount. The focusing speed is very very acceptable, although not quite as good as a pro-SLR (but then again it costs 1/5th of the cheapest pro-SLR). Overall, I'm very satisfied, and I think that it is a super bang for your buck -- specially when compared to a6300. We bought this camera before our trip to India and were extremely impressed with the quality of pictures that we took! The camera has so many modes and options to capture different scenes, colours, etc. We ended up taking about 2000 pictures with it (we ordered a 60gb SD card online - way cheaper). It also looks old school and trendy, lots of compliments. NO regrets. I have to give this camera five stars, because it has served me well. While I can't recommend the kit lens, that's usually the case with almost any camera. For the price, this camera just can't be beat. It has crazy fast, reasonably accurate autofocus, great image quality, in a tiny little package. I've been doing wedding photography with just this little guy and for the most part is has worked much better than I had expected. It has its quirks, for sure, but has proven incredibly reliable and versatile. The manual wasn't much good so went to youtube and found videos on how to use it. Took over 300 practice shots to learn how to use it, and am amazed at the versatility of the camera and the quality of the photos. Was super easy to quickly download lots of photos to my computer. The telephoto lens was easy to use and gave quality shots, even in low light. The anti blur option in SCN mode gave really good results at low light shooting. Tried screw on macro lenses and got excellent results, not a lot of distortion, although it takes a bit of getting used to the manual focus as the distance read outs are no longer correct once the macro lens is on. Set ISO to auto mode and the camera corrects your mistakes in manual shooting mode. Looking forward to years of quality photos with little effort. I had the camera for less than 2 months, used it ONCE, and the card reader breaks. I tried several memory cards and all it says is "UNABLE TO READ MEMORY CARD. REINSTERT MEMORY CARD". Nothing works. Best Buy won't return or exchange it past the 30 day policy, which is fine, I understand. I now have to pay to ship it to Sony and won't get it back for several weeks and will not have a camera for a big trip. Will never buy a Sony camera again. I did a great deal of research before deciding on this camera. it is everything I was hoping for. I am just starting to learn about taking great pictures and wanted something that would last through the growing period. I am having so much fun!!! best budget friendly camera who wants an almost a professional camera level. It can adapt many third party lense by using appropriate adapter. Small and lightweight. You don't have to worry about shoulder or back pain comparing to large dslr camera. **What i like most is that a lot of people will think it just a regular point and shoot camera. But they don't know that you are a carrying a great camera. Mirrorless camera might be the future of photography. This camera shows it most of the advantages already. Did a lot of research and settled on this great mirrorless camera, don't let the size fool you, it packs a punch with many great features. Many of the reviews are quite accurate such as the lack of instructions that comes with the camera, but you can download the full manual from the web. I highly recommend the YouTube videos from Gary Fong, they are very informative. The battery life is an issue, but there are ways to prolong it such as turning off the wifi , and dimming down the display, but you will find that buying an extra battery is the way to go. You cannot go wrong with this camera, take lots of pictures and have fun!! Being a DSLR Canon D5 MKII user for sometime I was in need of something a little (lot) more compact to travel with but still quite capable to DSLR quality images and features. So after careful research I decided to try out the A6000. So far very impressed by the speed of Auto-focus and pictures to the low light quality of pics. Taking it to Europe in place of my DSLR this year and hope to give it a good workout on that trip but so far very nice camera. I've been a DSLR user for quite some time but have been thinking a lot about getting into the mirrorless camera systems. I never had a Sony before but the reviews about this camera are quite good so I had to take a look. This camera is very impressive considering its size and all the features built into it. It feels solid in the hand and is incredibly responsive (it apparently has the fasted autofocus in its class). The focusing system is amazing which is great while tracking subjects in action situations. The selection of E mount lenses is growing but you can use adapters for just about any lens, even from Canon and Nikon. The kit lens is basic and is probably good enough for travel, family snapshots, etc. but you'll need good glass to get the most out of the wonderful sensor they put into this camera (same sensor as the Nikon D5300 and D7100). Highly recommend this camera for it's size, build quality and features. If you get the extra lens (55-210mm) and bag package deal, you'll get a good deal. I was already a Sony fan, but this camera exceeded my expectations; It has a fairly steep learning curve but the control and results have more than justified the choice. Once the menus were mastered the quality of the photographs has proved very high. I now find it very easy to use in the landscape and cityscape work that I prefer. I particularly like the small size and light weigh of the body. I have used it at higher ISO settings and find that the images are exceptionally low in noise, the low light stills very pleasing, particularly casual portraits.